"Avon Vale" redirects here. For the Royal Navy ship, see HMS Avon Vale (L06). The River Avon /ˈeɪvən/ is an English river in the south west of the country. 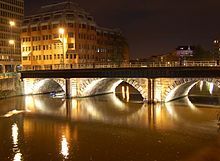 To distinguish it from a number of other rivers of the same name, this river is often also known as the Bristol Avon. The name "Avon" is a cognate of the Welsh word afon, "river". The Avon rises just north of the village of Acton Turville in South Gloucestershire, before flowing through Wiltshire. In its lower reaches from Bath to the Severn Estuary at Avonmouth near Bristol, the river is navigable and known as the Avon Navigation. The Avon is the 19th longest river in the UK at 75 miles (121 km) although there are just 19 miles (31 km) as the crow flies between the source and its mouth in the Severn Estuary. The catchment area is 2,220 square kilometres (860 sq mi). The name "Avon" is a cognate of the Welsh word afon [ˈavɔn] "river", both being derived from the Common Brittonic abona, "river". "River Avon", therefore, literally means "River River"; several other English and Scottish rivers share the name. The County of Avon that existed from 1974 to 1996 was named after the river, and covered Bristol, Bath, and the lower Avon valley. The Avon rises east of the town of Chipping Sodbury in South Gloucestershire, just north of the village of Acton Turville. Running a somewhat circular path, the river drains east and then south through Wiltshire. Its first main settlement is the village of Luckington, two miles (3 km) inside the Wiltshire border, and then on to Sherston. At Malmesbury it joins up with its first major tributary, the Tetbury Avon, which rises just north of Tetbury in Gloucestershire. This tributary is known locally as the Ingleburn, which in Old English means 'English river'. Here, the two rivers almost meet but their path is blocked by a rocky outcrop of the Cotswolds, almost creating an island for the ancient hilltop town of Malmesbury to sit on. Upstream of this confluence the river is sometimes referred to as the 'River Avon (Sherston Branch)' to distinguish it from the Tetbury Branch. After the two rivers merge, the Avon then turns south east away from the Cotswolds and then quickly south into the clay Dauntsey Vale, where it is joined by the River Marden, until it reaches the biggest town so far, Chippenham. The wide vale is now known as the Avon Vale, and the river flows on via Lacock to Melksham, then turns north-west through Bradford on Avon, where the centre of the town grew up around the ford across the river Avon, hence the origin of the town's name ("Broad-Ford"). This was supplemented in Norman times by the stone bridge that still stands today. The Norman side is upstream, and has pointed arches; the newer side has curved arches. The Town Bridge and Chapel is a grade I listed building. It was originally a Packhorse bridge, but widened in the 17th century by rebuilding the western side. On the bridge stands a small building which was originally a chapel but later used as a town lock-up. The Avon Valley between Bradford on Avon and Bath is a classic geographical example of a valley where four forms of ground transport are found: road, rail, river, canal. The river passes under the Avoncliff and Dundas Aqueducts and at Freshford is joined by the Somerset River Frome. Avoncliff Aqueduct was built by John Rennie and chief engineer John Thomas, between 1797 and 1801. The aqueduct consists of three arches and is 110 yards (100 m) long with a central elliptical arch of 60 ft (18 m) span with two side arches each semicircular and 34 ft (10 m) across, all with V-jointed arch stones. The spandrel and wing walls are built in alternate courses of ashlar masonry, and rock-faced blocks. The central span sagged soon after it was built and has been repaired many times. The Dundas Aqueduct was built by the same team between 1797 and 1801 and completed in 1805. James McIlquham was appointed contractor. The aqueduct is 150 yards (137.2 m) long with three arches built of Bath Stone, with Doric pilasters, and balustrades at each end. The central semicircular arch spans 64 feet (19.5 m); the two oval side arches span 20 feet (6.1 m). It is a grade I listed building, and was the first canal structure to be designated as a Scheduled Ancient Monument in 1951. The stretch of river below and above the aqueduct, where it is joined by Midford Brook, is used by the Bluefriars of the Monkton Combe School Boat Club up to six days a week since at least the 1960s. It then flows past Claverton Pumping Station, which pumped water from the River Avon into the canal, using power from the flow of the river. The pumping station is located in a pump house built of Bath Stone, located at river level. Water is diverted from the river by Warleigh Weir, about 200 yd (180 m) upstream. The water flows down a leat to the pumping station, where it powers a water wheel, 24 ft (7.3 m) wide and 17 ft (5.2 m) in diameter, with 48 wooden slats. At full power the wheel uses 2 tons (2 tonnes) of water per second and rotates five times a minute. The water wheel drives gearing which increases the speed to 16 rpm. From here, cranks drive vertical connecting rods which transfer the energy to two 18 ft (5.5 m) long cast iron rocking beams. Each rocking beam in turn drives an 18 in (0.5 m) diameter lift pump, which also take their supply from the mill leat. Each pump stroke raises 50 imperial gallons (230 l; 60 US gal) of water to the canal. In 1981, British Waterways installed two 75 horsepower (56 kW) electric pumps just upstream from the station. The Avon then flows through Bathford, where it is joined by the Bybrook River, and Bathampton where it passes under the Bathampton Toll Bridge. It is joined by the Lam Brook at Lambridge in Bath and then passes under Cleveland and Pulteney Bridges and over the weir. Cleveland Bridge was built in 1826 by William Hazledine, owner of the Coalbrookdale Ironworks, with Henry Goodridge as the architect, on the site of a Roman ferry crossing. Named after the 3rd Duke of Cleveland, it spans the River Avon at Bathwick, and enabled further development of Georgian Bath to take place on the south side of the river. It was designed by architect Henry Goodridge to take the traffic of his day, horse-drawn vehicles and pedestrians, and was constructed using Bath Stone and a cast iron arched span. Pulteney Bridge was completed in 1773 and is designated by English Heritage as a grade I listed building. The bridge was designed by Robert Adam, whose working drawings are preserved in the Sir John Soane's Museum, and is one of only four bridges in the world with shops across the full span on both sides. It is named after Frances Pulteney, heiress in 1767 of the Bathwick estate across the river from Bath. 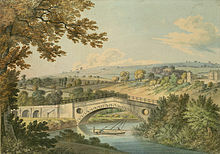 Pulteney approached the brothers Robert and James Adam with his new town in mind, but Robert Adam then became involved in the design of the bridge. In his hands the simple construction envisaged by Pulteney became an elegant structure lined with shops. Adam had visited both Florence and Venice, where he would have seen the Ponte Vecchio and the Ponte di Rialto. But Adam's design more closely followed Andrea Palladio's rejected design for the Rialto. Pulteney Bridge stood for less than 20 years in the form that Adam created. In 1792 alterations to enlarge the shops marred the elegance of the façades. Floods in 1799 and 1800 wrecked the north side of the bridge, which had been constructed with inadequate support. It was rebuilt by John Pinch the elder, surveyor to the Pulteney estate, in a less ambitious version of Adam's design. 19th century shopkeepers altered windows, or cantilevered out over the river as the fancy took them. The western end pavilion on the south side was demolished in 1903 for road widening and its replacement was not an exact match. In 1936, the bridge became scheduled as a national monument, with plans being made for the restoration of the original façade. The restoration was completed in time for the Festival of Britain in 1951, with further work being carried out in 1975. Bath and North East Somerset council have discussed plans to ban vehicles from the bridge and turn it into a pedestrianised zone, however it remains open to buses and taxis. Some 700 metres below Pulteney weir, the river is joined by the Kennet and Avon Canal which connects through Bath Locks. Together with the Kennet Navigation which joins the River Thames at Reading, this provides a through route for canal boats from Bristol to London. From this point downstream the river is known as the Avon Navigation. The Avon above Bath remains navigable as far as Bathampton where there is the remains of a flash lock. However, the lock past the weir below Pulteney Bridge was demolished when the weir was reconstructed, so passage between the sections is only possible for dinghies and canoes using the roller slipway on the side of the weir. Beyond its junction with the Kennet and Avon Canal, the Avon flows through Keynsham towards Bristol. For much of its course after leaving Wiltshire, it marks the traditional boundary between Somerset and Gloucestershire. For most of this distance the navigation makes use of the natural river bed, with six locks overcoming a rise of 30 feet (9 m). From Bath to Netham Lock where it divides into the New Cut and the Floating Harbour is 12 miles (19 km). The stretch is made navigable by the use of locks and weirs. In the centre of Bath it passes under various bridges including the Midland Bridge which was originally built by the Midland Railway Company to allow the Somerset and Dorset Joint Railway access to and from its Green Park Terminus Station. In November 2011 the navigation between Bath and Bristol was closed because of safety concerns about Victoria Bridge. Weston Lock on the outskirts of Bath is in what now forms the Newbridge. Weston Cut is a man made channel, opened in 1727, for boats to approach and pass through Weston Lock, which created an island between the cut and the river weir, which became known as Dutch Island after the owner of the brass mill established on the riverside in the early 18th century. Kelston Brass Mill overlooking Saltford Lock. Kelston Lock and weir have permanent moorings above and below them. The Riverside Inn and Saltford Marina are also close by. Saltford Lock and weir are overlooked by the remains of the Kelston Brass Mill, which was working until 1925. It is a grade II listed building. Alongside the lock is a pub, whose garden extends over the lock to the small island between the lock and weir. The lock was opened in 1727 and destroyed in 1738 by rival coal dealers to stop the use of the river for transportation. In its heyday, between 1709 and 1859 Swineford had an active brass and copper industry around the Swineford Lock which were served by the river which also provided water power for the cloth industry, as did the River Boyd, a tributary which flows into the Avon near Bitton. Keynsham Lock opened in 1727. Just above the lock are some visitor moorings and a pub, on an island between the lock and the weir. The weir side of the island is also the mouth of the River Chew. Hanham is the last tidal lock, after which the river is joined by Brislington Brook. Netham Lock is the point at Netham in Bristol at which boats from the River Avon, gain access to Bristol's Floating Harbour. Construction started in 1804 to build the tidal New Cut, where it is joined by the River Malago, and divert the Avon along the Feeder Canal to the harbour; a system designed and built by William Jessop and later improved by Isambard Kingdom Brunel. A weir carries the river into the New Cut and boats use the adjacent lock. Access to the harbour is only possible during the day when the lock keeper will open the gates unless the water level in the river between Netham and Hanham is above or below the level of the harbour. Netham Lock and the weir form part of Bristol's flood defence mechanisms and it was announced in December 2008 that they would be upgraded as part of the £11 million City Docks Capital Project. The River Avon in Bristol, looking towards Bristol Bridge with Welsh Back on the left. Boats of the Bristol Ferry Boat Company are moored in the foreground, and the spires of St Nicholas, All Saints' and St Mary le Port churches can be seen in the distance. In central Bristol, where the river is tidal, it is diverted from its original course into the New Cut, a channel dug between 1804 and 1809 at a cost of £600,000. The original course is held at a constant level by lock gates (designed by Jessop) and is known as the Floating Harbour. The Floating Harbour is protected by an 1870s replacement for Jessop's locks. This unusual dock has a tentacled plan resulting from its origins as the natural river course of the Avon and its tributaries, the River Frome and Siston Brook, and is intimately entwined with Bristol's city centre as few docks are. As a result of this, the Floating Harbour is one of the more successful pieces of dockland regeneration, with much of the dockside now occupied by residential, office and cultural premises, and the water area heavily used by leisure craft. The Floating Harbour gave the port an advantage by enabling shipping to stay afloat rather than grounding when the tide went down. Downstream of central Bristol the river passes through the deep Avon Gorge, spanned by Brunel's Clifton Suspension Bridge, the river is tidal and is navigable by seagoing vessels at high tide but drying to a steep sided muddy channel at low tide. It was largely the challenge of navigating this section that sealed the fate of the Floating Harbour as commercial docks and saw them replaced by docks at Avonmouth where the Avon joins the Severn Estuary. Before reaching its mouth it is joined by the River Trym at Sea Mills which was the site of Portus Abonae, a Roman port. Shortly after, it passes the village of Pill on the south bank where the Pill Hobblers were based in order to tow ships up the river to Bristol and where yachts and other boats still have moorings in Chapel Pill and Crockerne Pill. It then passes under the Avonmouth Bridge which carries the M5 motorway. The main span is 538 ft (164 m) long, and the bridge is 4,554 ft (1,388 m) long, with an air draught above mean high water level of 98.4 ft (30 m). The river then serves two major dock areas. The Royal Portbury Dock is located on the southern side of the mouth of the river. The deepwater dock was constructed between 1972 and 1977, and is now a major port for the import of motor vehicles. The Royal Portbury Dock has the largest entrance lock into any UK port, accommodating vessels up to 41 m (135 ft) beam, 290 m (951 ft) length and 14.5 m (48 ft) draft. The Avonmouth Docks are on the north side of the river and are one of the UK's major ports for chilled foods, especially fruit and vegetables. The first dock at Avonmouth, Avonmouth Old Dock, was opened in 1877 and acquired by Bristol Corporation in 1884. In 1907, a much larger dock, the Royal Edward Dock, was opened. The docks form part of the Port of Bristol and were operated by the Port of Bristol Authority, part of Bristol City Council, until 1991 when the council granted a 150-year lease to the Bristol Port Company. Currently, pilotage is provided by Bristol Pilots LLP who supply authorised pilots for the River Avon and Bristol City docks, as well as the Severn estuary and the Bristol channel; they are based at Avonmouth Docks. At Great Somerford the Avon has a mean flow rate of 3.355 cubic metres per second (118.5 cu ft/s), and a typical river level range between 0.16 metres (6.3 in) and 0.16 metres (6.3 in) with a highest level of 2.43 metres (8 ft 0 in). At Melksham the Avon has a mean flow rate of 6.703 cubic metres per second (236.7 cu ft/s). December 2013 was the highest level recorded at Bradford on Avon when the level reached 3.42 metres (11.2 ft) with a normal range at the monitoring station being 1.01 metres (3 ft 4 in) to 1.40 metres (4 ft 7 in). At Bathford the highest river level was also in December 2013 when it reached 4.41 metres (14.5 ft) while the normal range is 0.75 metres (2 ft 6 in) and 1.60 metres (5 ft 3 in), with a flow rate of 18.274 cubic metres per second (645.3 cu ft/s). In Bath at St James, which is 180 metres (590 ft) upstream of Pultney Weir the mean flow is 20.466 cubic metres per second (722.7 cu ft/s), with a similar flow (20.984 cubic metres per second (741.0 cu ft/s)) downstream of the weir. At the Destructor Bridge in Bath the typical height range is 0.40 metres (1 ft 4 in) to 0.81 metres (2 ft 8 in) with a high of 1.64 metres (5 ft 5 in) also in December 2013. At Saltford the range is 0.46 metres (1 ft 6 in) to 1.41 metres (4 ft 8 in) with a highest recording of 2.31 metres (7 ft 7 in) on 24 December 2013. At Keynsham the typical range is between 0.23 metres (9.1 in) and 2.09 metres (6 ft 10 in). The highest was on 25 December 2013 when it reached 5.36 metres (17.6 ft). At Netham Weir where the new cut carries the flow away from Bristol Harbour the typical range for the depth of the river is 0.15 metres (5.9 in) to 0.84 metres (2 ft 9 in) with the highest ever recorded being 3.22 metres (10.6 ft). For the purpose of water quality monitoring and improvement the river is divided into several catchment management areas; South of Malmesbury, Bristol Avon Rural and Bristol Avon Urban. In the rural area 22 water bodies are classified as good, 46 as moderated and 8 as poor. The main reasons for not achieving good scores are pollution from waste water, agriculture and rural land management. In the urban area one water body is rated good, while 12 are rated moderate and one is poor. The pollution from upstream is added to by the effects of industry, manufacturing and other businesses and is significantly affected by physical modifications to the water course. Within the catchment area there are 137 river water bodies and 6 lakes; of these 22 percent of rivers are rated as good ecological status, 40 percent good for chemical status and 31 percent good for biological status. The river is important for its dragonfly communities, with a strong population of Scarce Chaser (found in only six other areas in England), together with a strong population of White-legged Damselfly. Red-eyed Damselfly is also found. The river is also important for aquatic plants, including Loddon Pondweed. The Kellaways – West Tytherton Site of Special Scientific Interest, 3 miles (4.8 km) north east of Chippenham, is of geological interest as the river bank exposes Callovian highly-fossiliferous sandstone which contains well-preserved bivalves, gastropods, brachiopods, belemnites and ammonites. Further downstream at Newton St Loe the Newton St Loe SSSI is another Geological Conservation Review SSSI. It represents the only remaining known exposure of fossiliferous Pleistocene gravels along the River Avon. In conjunction with other sites within the wider area, it has aided the development of a scientific understanding of the history of early glaciation within South West England. The bodies of mammoths (Mammuthus) and horses (Equus) have been found at the site. 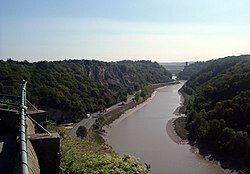 The Avon Gorge has been designated as a Site of Special Scientific Interest because it supports some rare fauna and flora, including species unique to the gorge. There are a total of 24 rare plant species and two unique trees: the Bristol and Wilmotts's whitebeams. Other notable plants include Bristol Rock-cress, Bristol onion, Spiked Speedwell, Autumn Squill and Honewort. Other areas along the river which have this designation include Bickley Wood, Cleeve Wood, Hanham for its large population of Bath Asparagus (Ornithogalum pyrenaicum). Stidham Farm near Keynsham contains at least At least 2 metres (7 ft) of Pleistocene terrace-gravels, consisting of limestone clasts mainly, but also with Millstone Grit, Pennant Sandstone, flint and chert clasts. The site is of considerable importance for studies relating to the possible glaciation of the area, and of the terrace stratigraphy, particularly as it is one of only two accessible terrace deposits in this part of the Avon valley. Newton St Loe SSSI is also listed for geological reasons as it represents the only remaining known exposure of fossiliferous Pleistocene gravels along the River Avon. In conjunction with other sites within the wider area, they have aided the development of a scientific understanding of the history of early glaciation within South West England. At Horseshoe Bend, Shirehampton the wooded cliff and a narrow salt marsh are supported by rocks of Devonian sandstone and Carboniferous limestone, overlain by with Triassic Dolomitic conglomerate. The site's principal interest and the reason for its designation as an SSSI is the presence of a population of the True Service-tree (Sorbus domestica) growing on the cliffs. This tree is nationally rare in Britain, and this site hosts the largest known population in England. Other notable species of Sorbus here are the whitebeams Sorbus eminens and Sorbus anglica, both of which are also nationally rare in Britain. The nationally scarce Large-leaved Lime (Tilia platyphyllos) also occurs, and herbs include Field garlic (Allium oleraceum) and Pale St. John's-wort (Hypericum montanum). The saltmarsh vegetation, which lies at the base of the cliff, is predominantly made up of Sea Aster (Aster tripolium) and English Scurvygrass (Cochlearia anglica). There are however two nationally scarce vascular plant species here as well – Slender Hare's-ear (Bupleurum tenuissimum) and Long-stalked Orache (Atriplex longipes). The tidal reaches of the River Avon provide habitat for waterbirds, with 64 species having been recorded up to 2004, including 21 species of shorebird, and 13 species of gull. A catchment board for the Avon was created by the Land Drainage Act 1930 and became the Bristol Avon River Board under the River Boards Act 1948; the Board was in turn replaced by the Bristol Avon River Authority under the Water Resources Act 1963. Twenty-five minor watercourses were added to the Authority's jurisdiction in 1973. Reorganisation in 1974, under the Water Act 1973 brought the Avon catchment into a new regional body, the Wessex Water Authority. Privatisation in 1989, saw responsibility for the catchment pass to Wessex Water Services Limited, which was purchased by American company Enron in 1998, placed in their Azurix subsidiary, and then sold to YTL Corporation of Malaysia in 2002. The distribution of archaeological finds suggests that the western end of the river between Bath and Avonmouth formed a border between the Dobunni and Durotriges during the late Iron Age, prior to the Roman conquest of Britain. Further east, between Bath and what is now Wiltshire, it may also have formed a border of the territory ruled by the Belgae. After the Roman occupation the river formed a boundary between the lands of the Hwicce (which became Mercia) and the kingdom of Wessex. The river Avon had been navigable from Bristol to Bath during the early years of the 13th century but construction of mills on the river forced its closure. The floodplain of the Avon, on which the city centre of Bath is built, has an altitude of about 59 ft (18 m) above sea level. The river, once an unnavigable series of braided streams broken up by swamps and ponds, has been managed by weirs into a single channel. Periodic flooding, which shortened the life of many buildings in the lowest part of the city, was normal until major flood control works were completed in the 1970s. The Bristol Avon Navigation, which runs the 15 miles (24 km) from the Kennet and Avon Canal at Hanham Lock to the Bristol Channel at Avonmouth, was constructed between 1724 and 1727, following legislation passed by Queen Anne, by a company of proprietors and the engineer John Hore of Newbury. The first cargo of 'Deal boards, Pig-Lead and Meal' arrived in Bath in December 1727. It is now administered by the Canal & River Trust. Throughout Bristol's history the Avon Gorge has been an important transport route, carrying the River Avon, major roads and two railways. The Bristol Channel and Avon estuary have a very high tidal range of 15 metres (49 ft), second only to Bay of Fundy in Eastern Canada; and the gorge is relatively narrow and meandering, making it notoriously difficult to navigate. 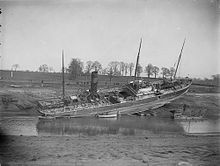 Several vessels have grounded in the gorge including the SS Demerara soon after her launch in 1851, the schooner Gipsy in 1878, the steam tug Black Eagle in 1861 and the Llandaff City. In 1877, Halfpenny Bridge, a pedestrian toll bridge, crossing the river from Bath Spa railway station to Widcombe collapsed with the loss of about 10 lives amongst a large crowd going to the Bath and West Agricultural show. The Avon has flooded several times in its recorded history. These floods include the one in 1799/1800 damaging Pulteney Bridge. Various points along the river including the valley around Freshford are at risk of fluvial flooding, as a result of sediment entering the river and narrowing the channel. To help cope with this some areas on the banks of the river are designated as a functional floodplain to cope with increased flow volumes. The potential changes to weather patterns as a result of climate change suggest that further measures are likely to be needed to protect the population from flooding risk. A tidal surge, combined with high water levels from the flooding of the surrounding area caused flooding in the city of Bristol. ^ "The Bristol Avon Catchment Abstraction Management Strategy" (PDF). Environment Agency. p. 4. Archived from the original (PDF) on 29 February 2012. Retrieved 3 March 2013. ^ Fisiak, Jacek (1997). Linguistic Reconstruction and Typology. Mouton de Gruyter. p. 218. ISBN 978-3110149050. ^ Miller, D. Gary (2 August 2012). External Influences on English: From its Beginnings to the Renaissance. Oxford: Oxford University Press. p. 17. ISBN 978-0199654260. ^ "River Avon". Information Britain. Archived from the original on 13 March 2013. Retrieved 3 March 2013. ^ Ekwall, Eilert (1960). The concise dictionary of English place-names. Oxford: Oxford University Press. p. 58. ISBN 0-19-869103-3. ^ Historic England. "- The Town Bridge and Chapel (312478)". Images of England. Retrieved 24 August 2006. ^ a b c d e f Allsop, Niall (1987). The Kennet & Avon Canal. Bath: Millstream Book. ISBN 0-948975-15-6. ^ a b Pearson, Michael (2003). Kennet & Avon Middle Thames:Pearson's Canal Companion. Rugby: Central Waterways Supplies. pp. 18–21. ISBN 0-907864-97-X. ^ "Dundas Aqueduct". Kennet & Avon Canal. Portsmouth University. Archived from the original on 12 August 2014. Retrieved 10 September 2006. ^ "Dundas Aqueduct". Transport Heritage Trust. Archived from the original on 3 April 2015. Retrieved 3 March 2013. ^ "Dundas Aqueduct". Grace's Guide. Archived from the original on 3 April 2013. Retrieved 3 March 2013. ^ "Dundas Wharf Project". Claverton Pumping Station. Archived from the original on 22 July 2009. Retrieved 14 September 2006. ^ Roger Cragg (1997). Wales and West Central England: Wales and West Central England, 2nd Edition. Thomas Telford. ISBN 0-7277-2576-9. ^ Historic England. "Cleveland Bridge (442453)". Images of England. Retrieved 30 October 2007. ^ a b Historic England. "Pulteney Bridge (443316)". Images of England. Retrieved 27 September 2008. ^ a b c "Pulteney Bridge". Bath Past. Jean Manco. Archived from the original on 3 September 2009. Retrieved 15 August 2009. ^ a b "Pulteney Bridge, Bath". Transport Heritage. Archived from the original on 10 March 2014. Retrieved 3 March 2013. ^ "Formal consultation starts on Pulteney Bridge pedestrianisation". Bath and North East Somerset Conservatives. Archived from the original on 10 March 2014. Retrieved 3 March 2013. ^ "Historic Pulteney Bridge traffic ban dropped". Bath Chronicle. 1 September 2011. Retrieved 3 March 2013. ^ "Update: New row over Victoria Bridge as part of river closed to boats". This is Bath. Archived from the original on 17 November 2011. Retrieved 17 November 2011. ^ Historic England. "Remains of 2 Annealing Ovens (399986)". Images of England. Retrieved 24 September 2006. ^ Clensy, David (14 June 2008). "Lock, stock and a barrel of fun" (fee required). Western Daily Press, archived at Nexis. Bristol United Press. p. 4. Archived from the original on 12 June 2011. Retrieved 12 August 2009. ^ "Navigation of Floating Harbour and Feeder Canal". Marine and waterway services. Bristol City Council. Archived from the original on 1 April 2013. Retrieved 3 March 2013. ^ Staff writer (12 December 2008). "Work starts to secure Bristol's floating harbour" (fee required). Bristol Evening Post, archived at Nexis. Bristol United Press. p. 15. Archived from the original on 12 June 2011. Retrieved 12 August 2009. ^ Buchanan, R. A. (1969). "The Construction of the Floating Harbour in Bristol, 1804-9" (PDF). Transactions. Bristol and Gloucestershire Archaeological Society. 88: 196. Archived from the original (PDF) on 4 October 2011. Retrieved 14 August 2009. ^ "Moorings". Portishead Cruising Club. 2016. Retrieved 11 March 2019. ^ "53008 - Avon at Great Somerford". Centre for Ecology and Hydrology. Archived from the original on 19 June 2015. Retrieved 19 June 2015. ^ "River Avon at Great Somerford". Environment Agency. Archived from the original on 19 June 2015. Retrieved 19 June 2015. ^ "53001 - Avon at Melksham". Centre for Ecology and Hydrology. Archived from the original on 19 June 2015. Retrieved 19 June 2015. ^ "River Avon at Bradford on Avon". Environment Agency. Archived from the original on 19 June 2015. Retrieved 19 June 2015. ^ "River Avon at Bathford". Environment Agency. Archived from the original on 19 June 2015. Retrieved 19 June 2015. ^ "53018 - Avon at Bathford". Centre for Ecology and Hydrology. Archived from the original on 19 June 2015. Retrieved 19 June 2015. ^ "53003 - Avon at Bath St James". Centre for Ecology and Hydrology. Archived from the original on 19 June 2015. Retrieved 19 June 2015. ^ "53022 - Avon at Bath ultrasonic". Centre for Ecology and Hydrology. Archived from the original on 19 June 2015. Retrieved 19 June 2015. ^ "River Avon at Bath Destructor Bridge". Environment Agency. Archived from the original on 19 June 2015. Retrieved 19 June 2015. ^ "River Avon at Saltford". Environment Agency. Archived from the original on 19 June 2015. Retrieved 19 June 2015. ^ "River Avon at Keynsham RL". Environment Agency. Archived from the original on 19 June 2015. Retrieved 19 June 2015. ^ "River Avon at Netham Weir". Environment Agency. Archived from the original on 19 June 2015. Retrieved 19 June 2015. ^ "South of Malmesbury". Catchment Data Explorer. Environment Agency. Archived from the original on 7 August 2016. Retrieved 19 June 2015. ^ "Bristol Avon Rural". Catchment Data Explorer. Environment Agency. Archived from the original on 7 August 2016. Retrieved 19 June 2015. ^ "Bristol Avon Urban". Catchment Data Explorer. Environment Agency. Archived from the original on 7 August 2016. Retrieved 19 June 2015. ^ "Bristol Avon Rural — Summary". Catchment Data Explorer. Environment Agency. Archived from the original on 7 August 2016. Retrieved 19 June 2015. ^ "Bristol Avon Urban — Summary". Catchment Data Explorer. Environment Agency. Archived from the original on 7 August 2016. Retrieved 19 June 2015. ^ "River Basin Management Plan, Severn River Basin District" (PDF). Environment Agency. p. 56. Archived (PDF) from the original on 19 June 2015. Retrieved 19 June 2015. ^ "The Scarce Chaser Libellula fulva Müller". British Dragonfly Society. Archived from the original on 3 April 2015. Retrieved 3 March 2013. ^ "Odonata of Brandon Marsh". The Wildlife Trusts. Archived from the original on 7 July 2015. Retrieved 25 May 2015. ^ "Kellaways – West Tytherton, River Avon SSSI citation sheet" (PDF). English Nature. Archived from the original (PDF) on 24 May 2011. Retrieved 24 November 2010. ^ "Newton St Loe SSSI citation sheet" (PDF). English Nature. Archived (PDF) from the original on 24 May 2011. Retrieved 24 November 2010. ^ BBC Bristol, "The Avon Gorge – Bristol's Great Glacier? Archived 1 April 2005 at the Wayback Machine." Retrieved 5 May 2006. ^ a b "Avon Biodiversity Action Plan" (PDF). Avon Wildlife Trust. Archived from the original (PDF) on 3 August 2012. Retrieved 3 March 2013. ^ a b Leivers, Mandy. "Discover the wildlife of the Avon Gorge & Downs". Bristol Zoo. Archived from the original on 19 March 2009. Retrieved 10 September 2008. ^ "SSSI citation sheet for Avon Gorge" (PDF). English Nature. Archived (PDF) from the original on 19 March 2009. Retrieved 7 December 2009. ^ "SSSI citation sheet for Bickley Wood" (PDF). English Nature. Archived (PDF) from the original on 26 March 2009. Retrieved 7 December 2009. ^ "SSSI citation sheet for Cleeve Wood, Hanham" (PDF). English Nature. Archived from the original (PDF) on 26 March 2009. Retrieved 7 December 2009. ^ "Stidham Farm SSSI citation sheet" (PDF). English Nature. Archived from the original (PDF) on 13 October 2006. Retrieved 13 July 2006. ^ "SSSI citation sheet for Newton St Loe" (PDF). English Nature. Archived (PDF) from the original on 24 May 2011. Retrieved 7 December 2009. ^ "SSSI citation sheet for Horseshoe Bend, Shirehampton" (PDF). English Nature. Archived from the original (PDF) on 19 March 2009. Retrieved 7 December 2009. ^ "No. 45968". The London Gazette. 4 May 1973. pp. 5605–5606. ^ Whittock, Hannah; Whittock, Martyn (2014). The Anglo-Saxon Avon Valley Frontier. Fonthill. ISBN 9781781552827. ^ "The Kennet and Avon Museum, Devizes". Kennet and Avon Canal Trust. Archived from the original on 25 April 2006. Retrieved 20 August 2006. ^ "Bath Western Riverside Outline Planning Application Design Statement, April 2006, Section 2.0, Site Analysis" (PDF). April 2006. Archived (PDF) from the original on 10 August 2016. Retrieved 2 May 2015. ^ "Carr's Mill, Lower Bristol Road, Bath Flood Risk Assessment" (PDF). Bath and North East Somerset. Archived (PDF) from the original on 22 July 2011. Retrieved 17 September 2010. ^ "Bristol Avon Navigation". Inland Waterways Association. Archived from the original on 6 August 2012. Retrieved 3 March 2013. ^ "Navigation of the river Avon". Bristol History.com. Archived from the original on 10 January 2007. Retrieved 22 September 2006. ^ Priestley, Joseph (1831). "Avon River, Gloucestershire" . Historical Account of the Navigable Rivers, Canals, and Railways, of Great Britain. Longman, Rees, Orme, Brown & Green – via Wikisource. ^ "Coast: Bristol Channel". BBC. Archived from the original on 25 May 2006. Retrieved 27 August 2007. ^ "Wrecks On The River Avon". Bristol Radical History Group. Archived from the original on 22 February 2013. Retrieved 3 March 2013. ^ "Kennet and Avon canal's history made into audio story". BBC. 12 November 2012. Archived from the original on 26 September 2015. Retrieved 24 February 2015. ^ Nanette South Clark (17 May 2010). "The Fall of the Widcombe Bridge over the Avon -- June 6, 1877". An Engineer's Aspect. Archived from the original on 24 February 2015. Retrieved 24 February 2015. ^ "Streams, rivers, waterways, and ponds". Freshford and Limply Stoke Environment Working Group. Archived from the original on 2 July 2015. Retrieved 1 July 2015. ^ "Strategic Flood Risk Assessment" (PDF). West Wiltshire District Council. Archived (PDF) from the original on 4 March 2016. Retrieved 1 July 2015. ^ "Bristol Avon Catchment Flood Management Plan" (PDF). Environment Agency. Archived (PDF) from the original on 2 July 2015. Retrieved 1 July 2015. ^ "Tidal surge on River Avon floods Bristol streets". BBC. Archived from the original on 25 September 2015. Retrieved 1 July 2015.